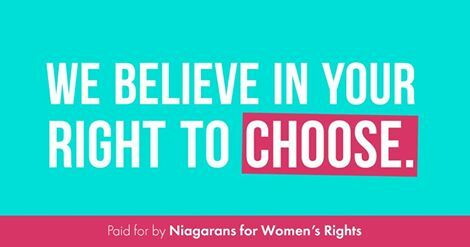 "Niagarans for Womens Rights are exactly what we sound like, residents in the Niagara Region of Ontario, Canada who are for women's rights! This campaign specifically addresses reproductive rights and has come to life through the cooperative effort of several women who are looking to balance the conversation of those rights in our community. Billboards that are Pro-Life and send damaging messages to women making difficult decisions are scattered throughout our Region, now moreso than ever before. Our goal is provide some balance, create a visual acknowledgement that there are people in this community who respect women, who trust women and who support their right to choice."